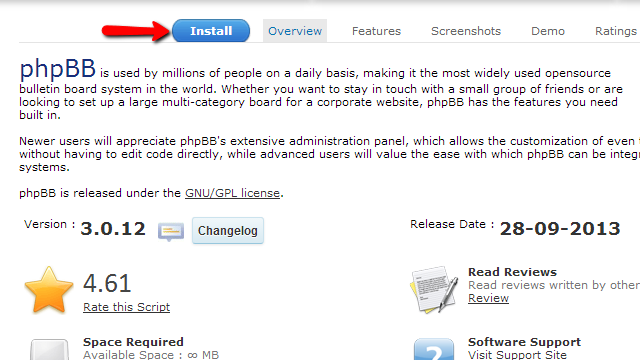 There is no other opensource bulletin board (forum) application like pphBB 3. Used by millions of people around the world this application offers the best forum experience you can find from such type of web application. 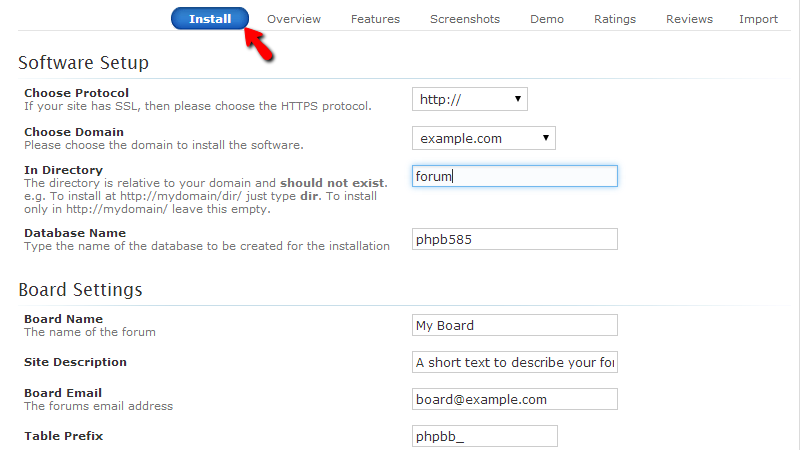 In this tutorial we will cover the automatic installation of the phpBB 3 forum platform using the Softaculous auto installer available in all of our packages. To begin with the installation you will need to access the Softaculous auto installer available in your cPanel>Softaculous. This icon will redirect you directly to the interface of the installer where you should be able to find the phpBB 3 platform either by navigating to the forums tab and then choosing the phpBB 3 plarform from the left vertical menu. No matter which method will be used you will always end up browsing the Overview page for the platform. Once the Install page you will need to fill the required fields (described below) so the installation process can be finished. Choose Protocol – The protocol your forum will be accessed at. Choose Domain – The domain name you would like your forum accessed at. In Directory – The subdirectory you would like your forum installed and accessible at. Note that you would like to have your forum directly accessible with your domain name and no subfolders in the URL you should leave this field blank. Database Name – The name of the database your forum will be using. Note that this is filled by default with randomly generated database name and probably you should leave it as it is. Board Name – The name of your forum. Site Description – The description of your forum. Table Prefix – The prefix of the tables in the database of your forum. 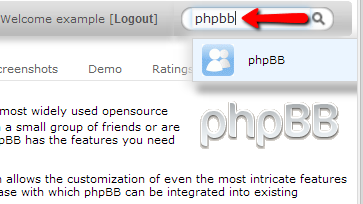 By default the prefix is filled with the “phpbb_” prefix and most probably you will need to leave it as it is. Admin Username – The username of your admin user. For securty purposes we advise using different username than “admin”. Admin Password – The password for your admin user. We recommend using strong password type. Such password type includes letters, numbers and symbols. Admin Email – The email address for your admin user. Usually this email is used for any bug reports sent from the platform. Select Language – The language you would like your blog displayed in. Of course there are few advanced options related to the backup of your forum. This backup solutions is supported and provided by Softaculous. If you would like to use it you will need to select the frequency of the backups viathe Automated backups drop down menu and then the Backup Rotation which is the number of backups Softaculous will keep for your application. 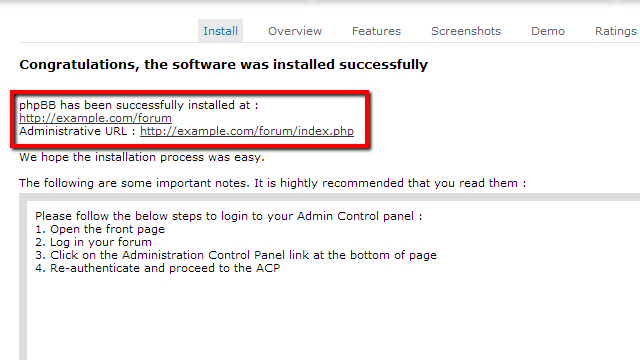 There you have it – nice and easy automatic installation of your phpBB 3 forum platform!